Dinner and entertainment is on us tonight! Say 'no' to the dishes and take the night off! We'll enjoy a delicious Italian dinner while listening to a jazz pianist. Come spend a relaxing evening with us! That's right! It's a day dedicated to ALL THINGS PIZZA! We will have lunch available in the Community Center, so we hope you can join us! All ages and levels of experience welcome. Light snacks will be provided afterwards. First 5 people to arrive will receive a FREE yoga mat! 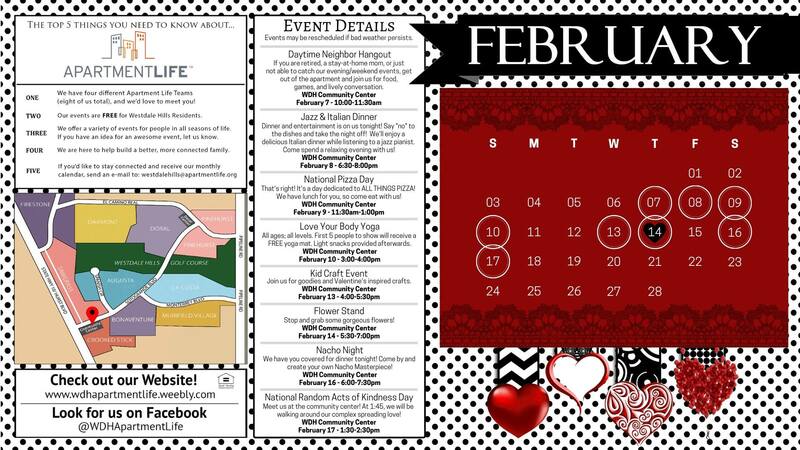 Join us for goodies and Valentines-inspired crafts! Stop by and grab some gorgeous flowers for your loved one! We have you covered for dinner tonight! Stop by and create your own Nacho masterpiece! Meet our Westdale Hills Apartment Life team at the community center. At 1:45pm, they will be walking around the complex spreading love!